“Gates of Perdition,” by R.P. Kraul, is a mystery thriller about a deft serial killer with a storied history. The killer is called the Indianhead River Killer, a man who suffered abuse as a child and now craves killing, although he hasn't resigned himself to this fate. The protagonist is a complex, multi-layered character. 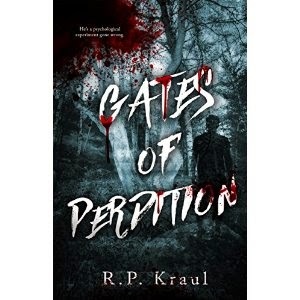 In my opinion, “Gates of Perdition” is character-driven novel, with Kraul developing interesting backstories for many of the characters. The writing is descriptive, graphic and telling, effectively relaying scary, mysterious, and emotional scenes to the reader. The plot is paced well, with ample time for development of the story before crescendoing. I’d recommend this to anyone who wants to read a serial killer novel with developed characters and tight descriptive writing.